Busan, a bustling city of approximately 3.6 million residents, is located on the southeastern tip of the Korean peninsula.The size of Busan is 765.64 ㎢ which is 0.8 % of the whole land of the Korean Peninsula. 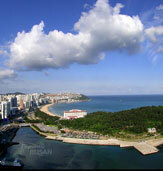 The natural environment of Busan is a perfect example of harmony between mountains, rivers and sea. Its geography includes a coastline with superb beaches and scenic cliffs, mountains which provide excellent hiking and extraordinary views, and hot springs scattered throughout the city. Busan is the second largest city in Korea. Its deep harbor and gentle tides have allowed it to grow into the largest container handling port in the country and the fifth largest in the world. In the coming years, capacity is set to grow further with the opening of the New Port. The city's natural endowments and rich history have resulted in Busan's increasing reputation as a world class city of tourism and culture, and it is also becoming renowned as an international convention destination. Shinsegae Centumcity is as big as 'Harbor city', Hong Kong and 'Roppongi', Japan. It is located only 10 minutes away from the congress venue. This is the biggest department store in the world with 298,905 ㎡ of shopping area. Shinsegae Centumcity is the home to the most prestigious international luxury brands as well as more than 680 different brands. It is also a place of relaxation and endless entertainments with its Spaland, Ice link and Theater. All this within the heart of Busan. Relax will enjoying the view of Centum' beautiful river and park at this popular hot spring. Spaland offers various Traditional Korean and Japanese health baths for you to indulge in. The popular hot springs for relaxation where you can enjoy the view of beautiful river and park. You can enjoy Korean traditional bath and Japanese bath at the same time in the two kinds of spring water that is good for your skin and pain.